Founded in 1778 on the banks of the Dnipr River, Dnipropetrovsk was known until 1926 as Ekaterinoslav in honor of Catherine II (Catherine the Great) whose troops conquered the territory. As the Soviet Union consolidated its power in the 1920’s, place names associated with the tsarist period were changed to reflect Communist control. Currently the third largest city in Ukraine, following Kyiv and Kharkiv, the population of Dnipropetrovsk is slightly over one million. It was a closed city until mid-1990 due to its extensive military industry, particularly Yuzhmash, a producer of intercontinental ballistic missiles, booster rockets, and related products. Dnipropetrovsk continues to be a center of heavy industry, hosting factories producing cast iron, rolled metal, pipes, mining and agricultural machinery, large appliances, and transportation equipment. Other prominent industries in the city include food processing and apparel manufacture, the latter for European firms. Notwithstanding the current economic crisis that affects the local economy, just as it affects the remainder of the country, Dnipropetrovsk remains a relatively wealthy city in Ukraine. The oblast government is considered among the most enlightened and competent in the country; private enterprise is encouraged and supported, thus diversifying the econ-omy and providing some hedge in conditions of economic turbulence. 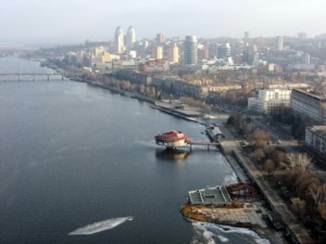 A view of the right bank of the Dnipr River, showing some of the new construction in Dnipropetrovsk. Historically, the city has been an important source of leadership for the former Soviet Union and for post-Soviet Ukraine. Soviet leader Leonid Brezhnev, former Ukrainian Prime Minister Valery Pustovoitenko, and former Ukrainian President Leonid Kuchma all spent significant portions of their careers in important leadership positions in the city. Yulia Tymoshenko, the immediate past Prime Minister of Ukraine, is a native of Dnipropetrovsk. Jews have lived in the region of Ekaterinoslav, part of the old Pale of Settlement, since the late eighteenth century. By 1897, the Jewish population of Ekaterinoslav had reached 41,240, more than one-third of the population of the entire city at that time. Pogroms occurred in 1881, 1882, 1905, and 1918; the 1905 attacks were the most devastating, killing 97 and wounding more than 100 people. Prior to the consolidation of Soviet authority in the 1920’s, the Jewish community was highly organized, maintaining a diverse network of Jewish religious, educational, and cultural institutions. It was an important center of both Zionism and the Chabad movement. A small Karaite community had its own prayer house. Twenty years after the demise of the Soviet Union, Dnipropetrovsk is once again an important center of both Zionism and the Chabad movement. The State of Israel enjoys a robust image in the city, reflecting substantial emigration from Dnipropetrovsk to Israel, continuing bonds between local Jews and their family members and friends in Israel, the presence of many Israelis as teachers and other community professionals, a stream of capable shlichim (emissaries) of Israeli organizations - the Jewish Agency, the Joint Distribution Committee, and Nativ (formerly Lishkat Hakesher) - and the pro-Israel views of Chief Rabbi Shmuel Kaminezki. Regularly scheduled commercial air service connects Dnipropetrovsk and Ben Gurion airport in Israel. Estimates of the current Jewish population of Dnipropetrovsk range from 25,000 to 40,000; it is the second largest Jewish population center in Ukraine, surpassed only by Kyiv. Dnipropetrovsk is the center of the Chabad movement in Ukraine. Honoring the historic presence of Chabad in the city that continued into the 1930’s, the late Lubavitcher Rebbe Menachem Mendel Schneerson appointed Rabbi Shmuel Kaminezki to the post of Chief Rabbi of Dnipropetrovsk in 1990. Rabbi Kaminezki is widely recognized as the most effective large-city community rabbi in all of the post-Soviet successor states. 1. As was the case during the writer’s most recent previous visit, in April 2010, the leading topic of discussion within the active Jewish community was the rising Menorah Center, the nearly 44,000 square meter Cha-bad Jewish community center designed to resemble a seven-branch menorah. The structure is now almost entirely enclosed and is scheduled to be dedicated in early winter of 2012 and opened for use later that year. 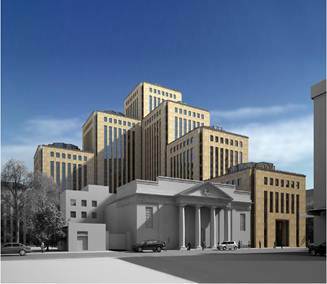 An architectural rendering shows the seven-tower Menorah Center to the side and rear of the Golden Rose Choral Synagogue (grey-colored pillared building) on Sholom Aleichem Street in Dnipropetrovsk. The major entrance to the Menorah Center will be at the small tower immediately to the right of the synagogue (as seen from the street). A long and broad corridor extending from the entrance through the remaining towers will be a Jewish mall, its walls faced with replicas of facades of old synagogues in the region. Interspersed among the synagogue facades will be entrances into a kosher supermarket, a Jewish book and artifacts store, a subsidized pharmacy, a business center, a bank branch, a notary, a travel agency, several kosher restaurants, a banquet/wedding hall, a 350-seat conference/concert hall, a lateral expansion of the existing synagogue prayer hall, and a children’s synagogue. 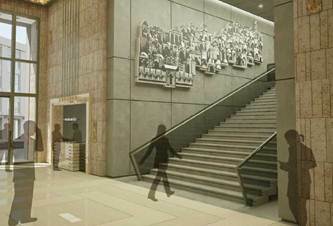 The main corridor also will host the entrance to a Museum of Jewish History and Culture in Ukraine, the only institution of its kind in the country. The upper floors of the Menorah Center will include a hotel of about 90 rooms, an extended-stay apartment hotel for individuals coming to the city for a week or more, and a hostel with 130 beds in rooms for four to six people. The hostel will permit the holding of Shabbatons and the accom-modation of visiting youth delegations at a reasonable cost. Another section of the Menorah Center will host the hesed or welfare center operated by the American Jewish Joint Distribution Committee. Rabbi Kaminezki is determined that Dnipropetrovsk Jewish elderly continue to feel comfortable in all of the facilities and programs operated in the city by Chabad. All areas of the Menorah Center will be handicapped-accessible. The Menorah Center also will include program space for various children’s activities, meeting rooms of different sizes, and Chabad community offices. It will not, however, contain any sports facilities other than a privately-run fitness center. Both construction and furnishing of the Menorah Center is being financed entirely by Hennadiy Boholubov and Ihor Kolomoisky, principals of PrivatBank. The Chabad community hopes to generate Menorah operating funds by renting office space in the Center to various businesses, a common strategy for managers of Jewish community facilities throughout the post-Soviet states. Some of the businesses, such as the ground floor kosher restaurants and various shops, will be geared toward visitors to the Center; however, management of the Center also is seeking unrelated commercial firms that find the Center convenient for their office needs. Hotel guests will be charged market rates for their accommodations, and use of all meeting and conference rooms will require fees. A small underground parking garage may provide another revenue stream. Notwithstanding these income-generating plans, several observers expressed concern that the Center would be able to cover its annual operating expenses, which one experienced property manager estimated at $3 million annually. Adding to expenses is the need for various security measures. According to Vyecheslav “Slavik” or “Zelig” Brez, Executive Director (Исполнительный директор) of the Philanthropic Fund of the Dnipropetrovsk Jewish Community (Благо-творительный фонд Днепропетровского еврейского общины), which supports Chabad interests in the city, the high visibility of the structure already has generated antisemitic comments on the web and elsewhere. Israeli security experts, he said, have been engaged as consultants in developing perimeter protection and other safeguards. The fears expressed by Mr. Brez are echoed and expanded upon by others who believe that the structure is ostentatious and that its control by Chabad only emphasizes the hegemonic influence that Chabad exercises in local Jewish life. Further, commented another senior local employee of Chabad (whose office will be in the new building), the facility marks the creation of a “ghetto in the middle of the city,” a development that he – and others – consider detrimental to the image of Jews in the area. The projected museum is the only comprehensive Jewish museum anywhere in the post-Soviet states or eastern Europe. See the author’s April 2010 in Ukraine, p. 8, for further information about the museum. Mr. Boholubov also is lay President of the Chabad Philanthropic Fund of the Dnipropetrovsk Jewish Community (Благотворительный фонд Днепропетровского еврейского общины), which supports Chabad interests in the city, and Mr. Kolomoisky is lay President of Всеукраинский Еврейский Конгресс (lit. translation, All-Ukraine Jewish Congress or English acronym VEK, also known in English as United Jewish Community of Ukraine). Both former residents of Dnipropetrovsk, Mr. Boholubov now spends most of his time in London and Mr. Kolomoisky lives in Geneva.